Danville Police are probing a home invasion which was reported early Monday (February 4, 2019) in which the victim is a 93-year-old man. Police Commander Joshua Webb says officers responded to a home in the 600 block of Beard Street at around 2:30 a.m. The victim told police he was asleep, and awoke to find three unknown males in his home who started battering him. The suspects fled before police arrived. The victim was taken to the hospital for evaluation and treatment of cuts and bruises he sustained during the attack. 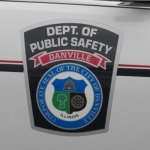 Danville Police are also trying to find the person responsible for firing several shots into an auto, according to information given by police to VermilionCountyFirst.com News. A 29-year-old Danville man says he was sitting in the vehicle in the 100 block of Walnut Street early Sunday morning when shots rang out. One of them struck the victim in the shoulder according to Commander Webb. No other injuries were reported. The victim was treated at OSF Sacred Heart Medical Center for the incident that occurred shortly after 2:00 am Sunday. And Commander Webb adds officers are also probing an armed robbery that occurred shortly before one o’clock Saturday afternoon. The victim is an 18-year-old male who says he was walking in the 1100 block of Chandler Street when he was approached by two subjects wearing masks over their faces. One of the subjects was armed with a handgun and demanded the victim’s belongings. The suspects fled in the victim’s white Pontiac Grand Prix, along with his jacket, wallet and cell phone. The victim was not injured, though. Danville Police are seeking help from the public as they attempt to solve all of these cases. If you have information that might help you are asked to call Danville Police at (217) 431-2250. Or call Vermilion County Crime Stoppers at (217) 446-TIPS.